In this month of Christmas, we bring you the life of Jesus of Nazareth, or Jesus Christ, the pivotal figure in Christianity. Jesus, who to Christians is the Son of God, is also considered to be the much-awaited Messiah of the Old Testament. Almost all texts and scholars agree that Jesus existed in the form we know him currently. However, one can find different versions of gospel narratives. Also, the biblical Jesus varied from the historical Jesus in many aspects. It is generally believed, though, that Jesus was a Jewish preacher or Rabbi from Galilee and was baptized by John the Baptist. It is also generally agreed upon that he was crucified at Jerusalem, as per the orders of the Roman prefect, Pontius Pilate. The historical Jesus has been variously portrayed as a Messiah, a leader of a revolutionary new movement, a healer, a saint, a social reformer and a philosopher. Christians believe that Jesus was conceived by the Holy Spirit and was born to Mary, the holy virgin and performed several miracles during his lifetime. He also founded the Church; accepted crucifixion to atone for others' sins; died on the cross; then arose from the dead, ascending to heaven, from where he will return one day. While most Christians revere Jesus as the Son of God and a part of the Divine Trinity, a few schools of thought reject this concept of Trinitarianism, either wholly or in part. Islam considers Jesus or Isa as the al-Masih or the Messiah. To them, he is the child of a holy virgin and is also the giver of the scripture. However, he is not considered divine in that religion and he was never crucified either. Judaism altogether rejects the belief that Jesus was a Messiah – on the contrary, they believe that he did not fulfill the Messianic prophecies mentioned in the Tanakh, a canon of the Hebrew Bible. Since the earliest times, Christians have referred to Jesus as Jesus Christ, Jesus of Nazareth and Christ. The word Christ comes from the Latin word Iesus and the Greek word, Christos, which is a rough translation of the Hebrew Masiah, meaning the "anointed one". Interestingly, there are indications that the name Yeshua may have been used in Judea at the time when Jesus was born. 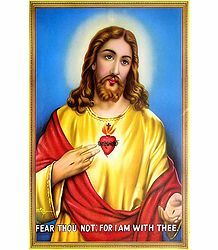 Most scholars believe that Jesus was a Galilean Jew, who was born in early first century and lived till sometime between 30 and 36 AD in Judea. According to the gospels, it is believed that the birth of Jesus coincided with the rule of Harod the Great, who lived till around 4 BC. However, there are also other indications that he was born during the Census of Quirinius, an event which occurred 10 years later. The years of Jesus' ministry also show discrepancies. While some records date the start of his ministry at around 28-29 AD, others give a range of 27-29 AD. Most experts aver that Jesus was crucified between 30 and 33 AD. The four canonical gospels, namely, Mark, Matthew, Luke and John, mainly chart out the biography of Jesus. However, other parts of the New Testament, such as the Pauline epistles, describe major events in his lifetime, such as the Last Supper. The Acts of the Apostles describe the ministry of Jesus, the Ascension of Jesus and so on. Let us go more into detail about the canonical gospels. The canonical gospels are basically four accounts, written by the authors mentioned above. They sometimes differ in content and chronology of events. The first three gospels are known as the Synoptic Gospels and are more or less similar to each other. John's Gospel, however, differs from them in several matters. Though the Synoptic Gospels are believed to be the most reliable source of information, not all of it is contained in the New Testament, which is considered to be historically the most reliable source. Instances such as the Nativity, the Resurrection, the Ascension, a few of Jesus' miracles, the Sanhedrin trial and a few others, are yet under debate. The gospels additionally include several discourses given by Jesus, such as the Sermon on the Mount and the Farewell Discourse; plus over thirty parables and his miracles, oftentimes related to a sermon. The gospels never claimed to provide a complete list of Jesus' life. It is primarily meant to be a collection of theological documents, with timeline being a mere second consideration. They are intended merely to give a general picture about the life and times of Jesus Christ. The Gospel of Luke, which primarily focuses on Mary, provides a detailed narrative on the birth of Jesus Christ. 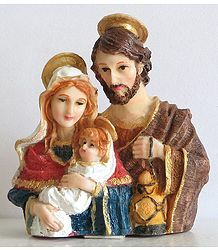 It states that Jesus was born to Mary and Joseph in Bethlehem. Mary, the Holy Virgin, miraculously conceives Jesus, by the grace of the Holy Spirit. The angel Gabriel tells Mary that she will shortly conceive and bear a child, Jesus. Following her betrothal with Joseph, she becomes pregnant. Joseph is concerned about it, but he has three dreams, where the angel assures him that this is a divine entity and that he should take Mary as his wife. Very close to her date of delivery, she and Joseph travel from Nazareth to Bethlehem, in order to register in the census ordered by Caesar Augustus. At this time, Mary gives birth to Jesus in a stable, surrounded by farm animals. Being in an open field and finding no shelter to spend the night in, she wraps up the newborn baby in cloth and places him in a manger. The angel announces the divine birth to some shepherds, who go to Bethlehem to see Jesus. Several wise men, called Magi, travel from the East in order to bring gifts to the young one, who would emerge as the King of the Jews. On hearing of Jesus' birth, Herod wants to get him killed. However, the angel warns Joseph about this in his second dream and the entire family flees to Egypt, to return to Nazareth at a later time. The New Testament mentions Jesus as having brothers and sisters, but uses the Greek word, "adelphos", which means "kinsman", rather than an actual sibling. Further, the Gospel of Mark seems to indicate that Christ was the son of a tekton or carpenter or builder. While there is no absolute record of this being a fact, he has often been associated as working with wood, yokes and ploughs. The gospels indicate that he could read and debate scriptures, but there is no record about his formal training in languages and writing. The gospels indicate accounts of John the Baptist foretelling the coming of someone "more powerful" than himself. When Jesus requests him to baptize him, the former initially shows reluctance. However, on Jesus' persuasion, he finally baptizes him. As Jesus emerges from the water, the Holy Spirit declares him as His Son and descends upon him in the form of a dove. The Synoptic Gospels then describe the Temptation of Christ, wherein Jesus undertakes a 40-day fast in the Judaean Desert, in order to resist the devil. Jesus then begins his ministry starting at the Judea countryside, near River Jordan. He travels from place to place, spreading his teachings and performing miracles; then completing his ministry with the Last Supper along with his disciples at Jerusalem. Jesus appoints twelve apostles during the early stages of his ministry. In the Gospel of Luke, he sends over 70 followers in pairs to prepare towns for his visit. They are trained to talk to the residents, to heal the sick and to spread the word that the Kingdom of God is coming soon. Jesus and his disciples were once crossing the Sea of Galilee, when their boat was rocked by a furious storm, with huge waves breaking over it. Jesus got up from his rest and rebuked the wind, ordering the waves to be quiet and still. It suddenly became completely calm and the rest of their journey was uneventful. Also known as the Miracle of the Five Loaves and Two Fish, John narrates how Jesus used five small barley loaves and two fish to feed a huge number of people. Hearing that John the Baptist had died, Jesus withdrew into a remote place. But the crowds of people followed him there. Filled with compassion for them, he started healing the sick. It soon became dark and the followers found that there was nowhere to go and eat. A boy supplied them five loaves and two fish. Jesus asked everyone to sit on the grass. Looking heavenward, we offered thanks for the food and broke the loaves. He directed his disciples to break the loaves and distribute them among the people. Miraculously, everyone was fed to their satisfaction and no one went hungry. Jesus once sent his disciples sailing and chose to remain behind and pray. There was a storm at night and the disciples were caught in the thick of it all, right in the middle of the sea. It was then they saw Jesus walking on the water, coming towards them. Christ walked to the ship, again calmed the storm and reached them to the safety of the shore. There are several other stories of miracles and parables of Jesus, ending with the Confession of Peter and the Transfiguration. In all of them, Jesus teaches his disciples to have faith and shows them the power of love and spirituality. At the beginning of the journey to Jerusalem, Jesus slowly starts disclosing his true divine identity to his disciples, also predicting his own suffering and death. In a dialogue during Peter's Confession, he declares himself as Christ and the Son of God. Then, taking Peter and two other apostles to the top of a mountain, he "transfigures" his own form. His face shone like the sun and his clothes turned a brilliant, radiant white. A voice coming from the skies state that he is God's Son and that he is also meant to serve as God's Messenger. The Passion Week or the last week of Jesus' life starts with an account of his entry into Jerusalem, ending with the Crucifixion. Occurring just a few days before the Last Supper, Jesus rides into Jerusalem on a young donkey. The people there cheer his entry, singing psalms all the way. This adds to the existing animosity between Jesus and the establishment in that region. Jesus then undertakes the Cleansing of the Temple, wherein he expels the corrupt money changers from the temple, accusing them of turning it into a den of thieves. This is the only time that he is shown using physical force. This and similar other episodes further stoke the fire raging between Jesus and the Jewish elders and this hostile environment continues throughout Passion Week. At this time, Judas Iscariot, one of Jesus' own apostles, decides to betray Jesus and strikes a bargain with the Jewish elders to hand him over to them for a reward of thirty silver coins. The Last Supper is the last and final meal that Jesus shares with his twelve apostles at Jerusalem. This very important episode occurs just before his Crucifixion. 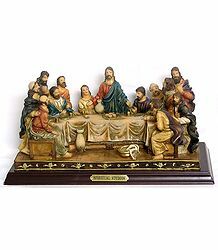 During the course of the meal, Jesus predicts that one of his own apostles would betray him and insisted that it would be one of those present there at the table. 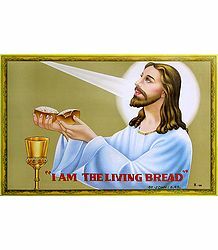 Jesus then takes the bread and breaks it, giving it to his disciples, saying, "This is my body, which is given for you". He then asks them to take a sip from their cups, saying, "The cup that is poured out for you is the new covenant in my blood". The Gospel of John also includes a long sermon made by Jesus, asking his disciples to prepare mentally for his departure. This is known as the Farewell Discourse. After the Last Supper, Jesus, along with his disciples, takes a walk in the garden nearby, to pray. Judas comes there accompanied by some Jewish priests, elders and people with weapons. He kisses Jesus and then arrests him. One of the disciples attacks and injures one of the members in the crowd, but Jesus miraculously heals him. After his arrest, his disciples go into hiding. Christ is taken to Sanhedrin, a Jewish judicial body, where he is mocked and beaten in the night. Early next morning, he is taken to trial. Jesus speaks very little throughout and never answers directly to any of the priests. When asked if he is the Messiah, he merely agrees with it and then predicts the coming of the Son of Man. He is then taken to Pilate's Court and finally to Herod Antipas. They then decide to release Barabbas, a dreaded murderer, and crucify Jesus instead. Pilate drapes a rich robe around Jesus to further mock him and writes a sign, which reads: "Jesus of Nazareth, the King of the Jews" (which is abbreviated as INRI) across Jesus' cross. The soldiers then place a Crown of Thorns on his head and take him for crucifixion, continuing to beat and taunt him on the way. 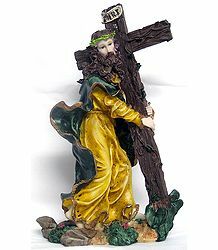 Jesus is then made to carry his crucifix and Jesus, his followers and the guards proceeds towards the site of crucifixion at Calvary. Once there, the soldiers crucify him and cast lots for his clothing. One soldier pierces Jesus' side with a lance and water flows out of it. The Gospel of Matthew states that when Jesus breathes his last, Nature reacts violently and earthquakes break open tombs. It is believed that Joseph of Arimathea removes Jesus' body from the cross on the same day, wraps it up in clean cloth and buries him in a tomb, sealed with a stone and placed under guard. According to the New Testament, Jesus resurrects on the first day of the week after the crucifixion. His tomb is discovered to be empty and his followers report of encounters with him. Jesus then makes several appearances to his disciples, giving them advice and performing miracles. 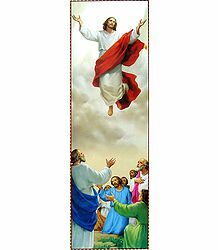 Forty days after his Resurrection, Jesus makes his Ascension to the Heavens. Before that, he asks his disciples to spread his teachings to the people of the world. He is then lifted up till a cloud takes him away from their sight. Jesus then continues to shower his grace on his followers by way of dreams, visions, revelations and miracles. Jesus' death and resurrection are commemorated by Christians around the world, laying special emphasis on the Holy Week, which includes Good Friday and Easter Sunday. 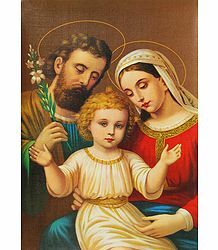 While most portraits show Mother Mary carrying baby Jesus in her arms, there are rare pictures of the Holy Virgin holding Jesus, with Joseph standing beside them. 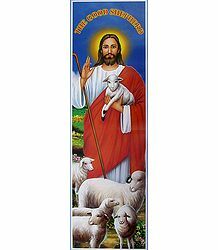 Jesus is also often depicted as gently holding a sheep in his hands or around his neck. He is considered the Good Shepherd, that is, the one who lays down his life for the sheep. This symbolic representation of Christ appears in Early Christian art and continues to be used till today. As this imagery evolved, Jesus was also portrayed draped in rich robes and with a halo around his head. Experts believe that this might only have been a metaphor and not an actual instance. This imagery is found in the Catacombs of Rome and similar other regions and sects, where Christian and pagan symbols are used in combination. 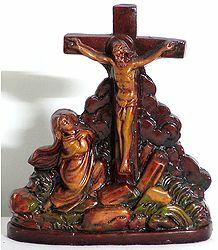 The image of Christ on the Holy Cross is most often used to portray him. Christ's suffering and his eventual death by crucifixion are the central aspects of the Christian faith. Jesus gave up his own life to atone for the sins committed by others. 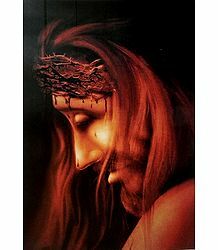 He is stripped of his robes and is given the Crown of Thorns to wear around his head. He is asked to bear his own cross to Calvary. On the way, he meets several womenfolk, including his mother, Mary, and Mary Magdalene as well. His hands and feet are bound and he is then nailed to the cross. Even while suffering the utter physical pain and humiliation, he uttered the words, "Father, forgive them, for they do not know what they do." This shows his love and compassion for all around him, even towards his own most bitter enemies. Christians commemorate this Holy Day as Good Friday. Many believers undertake prayers and fasts on this day, in order to atone for their own sins. The following Sunday is celebrated as Easter. Christianity, the religion founded by Jesus Christ, is one of the world's largest religions, with over 2 billion followers all over the world. A monotheistic religion is based on the life and teachings of Christ, as described in the New Testament. Christians believe that Jesus is the Son of God and a savior of mankind, who is human, yet divine. Most Christians also believe that Jesus will return to judge humankind, both living and dead, and grant eternal life to his followers. The Ten Commandments are a set of biblical principles, which chart out ethics and worship in Christianity. Followed by most forms of the religion, they include instructions to worship only God, keep away from sin, to keep the Sabbath, to refrain from adultery, murder, theft and so on. Different groups may have slightly different interpretations of the Commandments, but are essentially the same in gist. Christians assemble at churches for mass or communal worship every Sunday, which is considered as the Day of Resurrection. At these sessions, scripture readings are taken from the Old and New Testaments and also the gospel accounts. This sermon is followed by congregational prayers, including thanksgiving, confession and so on. The Eucharist is also part of traditional worship, wherein followers partake of a meal of bread and wine, commemorating the Last Supper. While most churches practice open communion, some Christian denominations conduct closed communion in certain cases. Yet other groups depart from traditional methods of worship to form their own rules and regulations, like not meeting every week; singing rock and pop music in praise of the Lord; or even sitting quietly in worship. 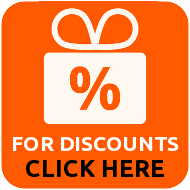 Worship also varies for specific occasions such as baptism, feasts days, weddings and so on. Sacraments are religious rites believed to be instituted by Christ. While Baptism and Eucharist are the two most important sacraments, there are five others commonly practiced, known as Confirmation, Holy Orders, Confession, Anointing of the Sick and Matrimony. Protestant groups do not believe that these rites communicate grace to the followers. They refer to these as ordinances. Baptism involves the use of water to admit a person as a member of the Church. Some schools of thought believe that it is supposed to enhance a person's faith, ultimately leading him to salvation. The various methods of baptism include Baptism by Immersion, Baptism by Submersion, Baptism by Affusion, Baptism by Aspersion and, of course, Infant Baptism. The Cross is the most widely acknowledged and used symbol of Christianity across the world. 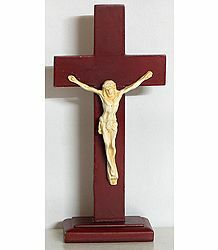 Though the Crucifix has been a very early sign of worship for Christians, it appeared only in the 5th century. The fish (or Ichthys) and the rosary with a cross hanging from it are yet other important symbols for Christians. Some more signs of the divine include the dove, which is symbolic of the Holy Spirit; the sacrificial lamb, which is symbolic of Jesus' sacrifice and so on. Holy nails and the Crown of Thorns are much venerated as relics associated with Christ. The Shroud of Turin, which is associated with the Holy Face of Jesus, is also considered very sacred among Christians. Christmas is annually celebrated to commemorate the birth of Jesus Christ. Observed as a major holiday season almost all over the world, this day falls on December 25 every year. Incidentally, it is celebrated with much gusto even among the non-Christian population in many regions across the world. The word Christmas is believed to have originated from the term, "Christ's Mass". It is also alternatively referred to as "X'mas". The celebratory customs associated with Christmas include decorating Christmas trees, adorning the house with garlands and ornate wreaths, meeting family members, holding nightlong holy processions, gifting, singing carols, praying, feasting, participating in the Christmas Eve Church Mass and the Ball and so on. 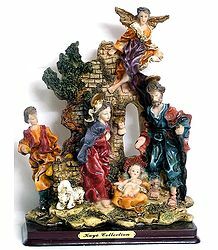 Many Christians and even non-Christians create a Nativity scene or crèche in their own homes, using small dolls to portray the incident of Jesus' birth. This crib is maintained for an entire week after Christmas. Several festive figures, such as Santa Claus, Father Christmas, Saint Nicholas and Christkind, who have their own lore associated with them, bring gifts and sweets to one and all. Incidentally, Santa, probably the most loved figure among children, makes his appearance to please non-Christian children as well. A variety of Christmas celebrations have been adopted to suit regional and local cultures in each region as well. The Eastern Orthodox Church undertakes a 40-day Nativity Fast, prior to the day of Christmas. Western Christianity, on the other hand, celebrates four week of Advent. While the brightly ornamented and lit Christmas tree takes center stage among the Christmas decorations, several other materials are used too, including the Nativity scene mentioned above, holm, ivy, bays, holly and so on. Popular colors used for the decorations are red, green and gold. Fir trees are popular to use as Christmas trees, as they are triangular and point heavenward, thereby symbolizing the Trinity. The Christmas tree and the house are decorated with flowers and evergreen foliage, lights and banners, bells, candles and so on. Carols are sung by groups of people, both young and old. These people travel from house to house, singing these songs, which were originally communal folk songs, sung during several other occasions as well. Carols are also sung in Churches. A traditional Christmas family feast is part and parcel of any celebration. The cuisine featuring in the feast differs from region to region. While many regions serve up several types of fish, meat turkey, goose, vegetable, bread and cider; special items include the quintessential Christmas pudding, mince pies and fruit cake. Exchanging Christmas cards and gifts forms a major part of X'mas festivities. The cards feature interesting artwork and some themes, symbols and colors associated with Christmas. Many countries even issue commemorative stamps at Christmastide. People use these stamps to mail their festive cards. A number of gift-giving figures, including Santa Claus, Father Christmas, Saint Basil and Saint Nicholas or Sinterklaas are associated with this festival. The undisputed favorite among them, of course, is Santa Claus. The one with the flowing white beard, red dress and jolly attitude, the origin of Santa Claus can be traced back to the Dutch Sinterklaas or Saint Nicholas. He is known for his guffawing laugh, love for children, great generosity and giving of gifts. The modern image of Santa Claus, as we know him, was probably created in the United States of America. He is now portrayed as an overweight, middle-aged, jolly man, who travels around the whole world in a sleigh stocked with gifts; driven by a team of flying reindeer. 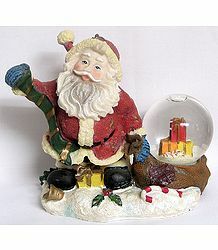 Santa is usually believed to live on the North Pole, in a house, which also includes a workshop. Here, he creates gifts with the help of his elves and other supernatural beings. He watches the children during the year and judges what gifts they should get. 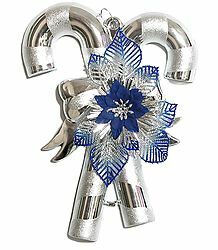 It is said that the children, who have been good all year get the best gifts. Interestingly, there is a city in Alaska, where a tourist attraction by the name of "Santa Claus House" has been built. Santa is believed to enter through the chimney of each residence and stuff children's Christmas stockings with a variety of gifts and sweets. He is said to silently carry out his work in the night, with the help of his elves and fairies. The children wake up in the morning to see their stockings filled up to the brim with their favorite things. Christmas will be here very soon this year. We wish all our readers a Merry Christmas and a wonderful, peace-filled and prosperous New Year! Love and light to one and all during this holy festive season.